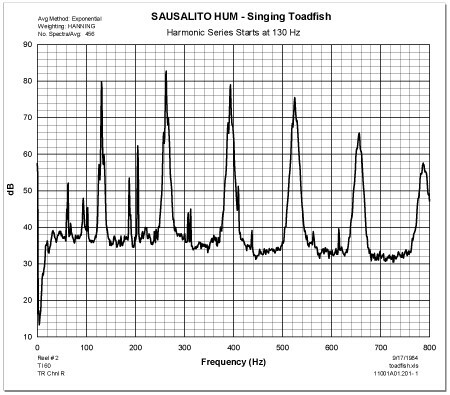 If you have a sound card installed on your computer system, the background noise you are hearing is the actual recording of the "Sausalito Hum." The mystery behind the persistent hum that has tormented houseboat residents in Sausalito, California, for years was finally solved. For years during the summer, from 9 p.m. to about 5 a.m., a mysterious hum that sounded like a B-17 bomber has been waking residents who live on the water in Sausalito, California. "The noise came through the water and caused the concrete hull to vibrate," reported one houseboat resident. The plot thickened when a similar noise was discovered near a Naval Base in the State of Washington. FHA volunteered to try to discover the source of the hum. All sorts of possibilities were investigated. Steve Neal, of FHA, recorded the noise on tape, and in the process got immortalized as the "Professor" in the rowboat in Phil Frank's Farley comic, in the San Francisco Chronicle. FHA analyzed the tape in the lab and found that the signature of the noise source has an unusual frequency spectrum and is not consistent with typical signatures for standard mechanical or electrical equipment. We suspected that a form of marine life was the source of the noise. Tape recordings from captive fish recorded in 1977 by Joe Wible of Cerritos College of Norwalk, California were obtained. Analysis by FHA demonstrated identical acoustical characteristics of the sounds recorded in Sausalito and those from the captive fish. The culprit was the plain finned Midshipman fish (porichthya notatus) historically called the California singing fish. 2700 Rydin Road, Suite F, Richmond, CA 94804, USA.